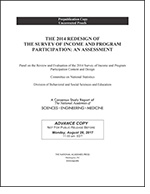 An ad hoc committee will conduct an evaluation of the redesigned Survey of Income and Program Participation (SIPP) of the U.S. Census Bureau. Begun in 1984, SIPP uniquely provides monthly information on family composition, income, employment, program participation, and other characteristics for a large sample of households followed over a period of several years. SIPP traditionally has interviewed sample households every 4 months with a core questionnaire and topical modules. Beginning in 2014, SIPP will use a new design in which sample members are interviewed once a year with the use of a streamlined set of content and an event history calendar (EHC) to prompt recall of intra-year changes in characteristics. The committee will conduct analyses of data collected under the new and old designs, compared with administrative records whenever feasible and appropriate, to determine the extent to which the new design improves upon, maintains, or underperforms the old design in terms of the quality of key estimates, such as poverty rates and participation in assistance programs, and other metrics. The committee will also evaluate the depth and breadth of the 2014 SIPP content; evaluate the impact of the new SIPP data collection instrument on respondent burden; and consider content changes for subsequent SIPP survey panels that could improve the utility of the data. The committee will review the results of the analyses, deliberate, and prepare a report at the conclusion of its study with findings and recommendations for potential modifications that could improve SIPP data quality and usefulness under the new design. John L. Czajka (Chair), Mathematica Policy Research, Inc.